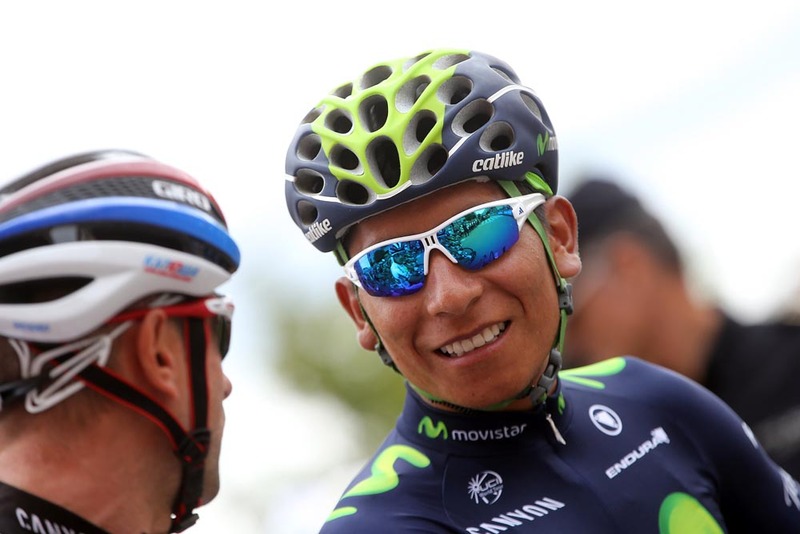 It was another torrid day for Colombian overall hope Nairo Quintana. The 25-year-old Movistar leader was again out of sorts during a stage that he should have comfortably ridden in the bunch. Instead, he was dropped and had to be paced back up to the peloton. The 2014 Giro winner finished as runner-up to Chris Froome at the Tour de France, and now it is starting to look like fatigue has set in. Quintana is reportedly still suffering from the fever and stomach upset that saw him lose time to overall leader Fabio Aru (Astana) on stage 11. Quintana was reportedly close to throwing in the towel on stage 11, but has elected to try and ride out his illness. He’s currently 11th overall, over three minutes adrift of Aru. With tomorrow’s stage 14 featuring another high mountain finish, it’s a tall order for Quintana to recover overnight and not lose more time. Quintana isn’t the only rider to be feeling the effects of a long season and a testing route at the Vuelta. Many of the other riders are feeling fatigued, and are not looking forward to the remaining nine days. Belgian Iljo Keisse (Etixx-QuickStep) has also obviously had enough, tweeting a succinct summary of his stage 13 experience. One rider who is obviously having a good time is stage 13 winner Nelson Oliveira (Lampre-Merida) who has scored a big win after six seasons of trying. Though the wins have been few, the way in which he scored his victory today was a display of experience and tactical nous. The Portuguese rider picked the exact right moment to attack. With a long 27 kilometres to go, Oliveira left the 24-man escape group and used his time trial ability – he is Portuguese national champion in the discipline – to keep not only the break at bay, but the peloton too. He gave himself plenty of time before the line to zip up his jersey, straighten it out to please the sponsors and take a well-deserved bow to the cheering spectators. A perfect finish to a perfect performance. With team leader Chris Froome out of the race with a fractured foot, Team Sky seems to be reinvigorated (well, perhaps apart from Geraint Thomas – see above). Irishman Nicolas Roche was back in the escape group today after suffering during the week with the effects of crashes and the heat and climbing on stage 11. His third place on the stage, handily around four minutes ahead of the peloton, saw him rise back up the general classification from 21st to 16th. But more than that, he looked like he’d got his good legs back on, just in time for the next set of mountain stages. Team-mate Sergio Henao was with Roche in the break, and was another to benefit from the time advantage, rising from 28th to 23rd, and keeping Sky’s options open. Although Fabio Aru (Astana) has established himself in the race lead and remained unchallenged for the past two days’ transition stages, the general classification has been in a state of flux throughout most of the race. It shows no signs of settling down with the most decisive days yet to come. The riders stacked up behind Aru are a diverse bunch, some a threat in the mountains, and others a threat in Wednesday’s individual time trial. Spaniard Joaquim Rodriguez (Katusha) sits in second, just 27 seconds behind Aru, with former race leader Tom Dumoulin (Giant-Alpecin) in third at 30 seconds. Although Aru got the better of Rodriguez on the stage 11 that the latter helped design, Rodriguez is still a major player in the mountains and arguably more punchy over shorter climbs. Dumoulin is one of the leading favourites in the TT, and could easily make up minutes over rivals less adept at riding against the clock. Rafal Majka (Tinkoff-Saxo), Esteban Chaves (Orica-GreenEdge), Alejandro Valverde (Movistar), Daniel Moreno (Katusha) and Mikel Nieve (Team Sky) are all within two minutes of Aru, setting up a closely-fought final week.